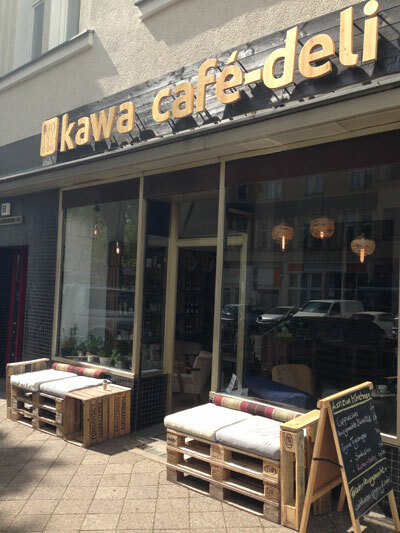 Since April 2015 south Berlin has a vegan cafe, the KAWA. We commit ourselves to take fill control or all ingredients used in our produce and to guarantee its freshness and it's excellent tolerability. Our daily changing menus compromise vegan+gluten free Bircher Muesli, vegan sandwiches, wraps and focaccia, our famous vegan+gluten free soups and finally our home-bake vegan+gluten free cakes and muffins. Along with our excellent coffees (JoCaffe's award winning dolce roast) we proudly serve our customers our innovative and health-boosting teas. Finally our powerful mixer makes the smoothest smoothies in all of Berlin and in combination with our know how we will surprise our customers with ever-changing smoothie and lemonade experiences. You can either enjoy all of our freshly made snacks and drinks in our comfy cafe or you can take it away home or to work. Other than our tasty cafe food we have a delicious variety of delicatessen on offer. We have a small but fine selection of biscuits, pasta, breakfast cereals, and hand-picked teas and wines for very fair prices. We believe that quality food must still be affordable. And we're proud to say that most of our food is vegan ( on request milk is used for our coffees ) and gluten free!